Toyohara Kunichika (1835-1900) Thirty-six Good and Evil Beauties, 1876. Oban. Another outstanding print from Thirty-six Good and Evil Beauties. In this print an unknown woman, presumably evil, given her posture, is wielding a knife in the grip of a ferocious storm. 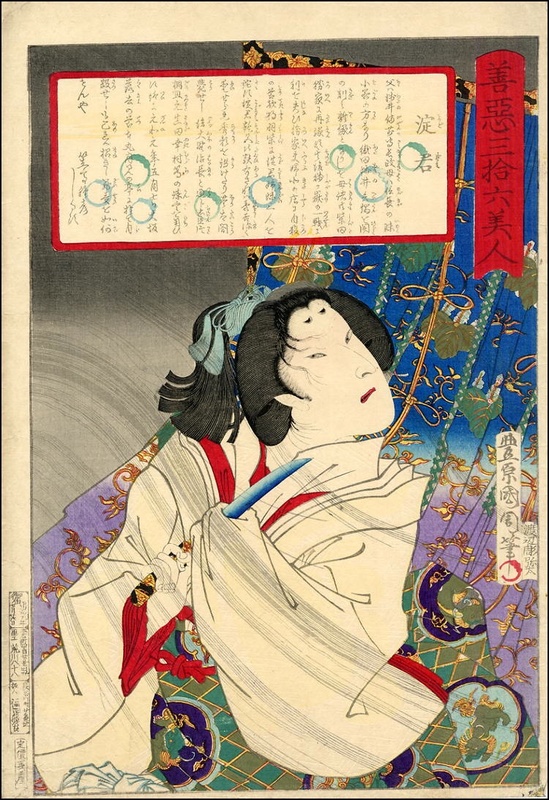 Kunichika represents the wind with exquisite delicacy as he does the curtain in the background and the drawing of the figure. This is an exceptional woodblock print. It is sometimes easy to forget that these designs are cut from many separate blocks of wood with chisels; the delicacy of colour and line in this image is astonishing. The print is full size with margins, the condition is very fine, colour is strong and the impression early and fine.